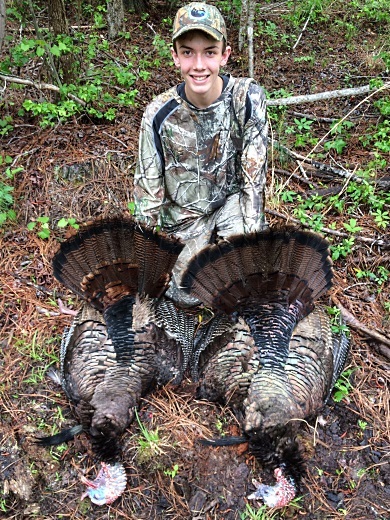 Patrick Lanford, a S.C. Department of Natural Resources Take One Make One youth hunter from Pawleys Island in Georgetown County, had never harvested a turkey before. Patrick gave it his best shot on April 23, and what a shot it was. As the sun started creeping up that morning, S.C. Department of Natural Resources (DNR) 1st Sgt. Ryan Williams, who mentored the hunt, recalls: "The birds were 20 feet away and you could feel the gobbles." This is all it took to give Patrick a permanent case of turkey fever. With trembling hands, Patrick pulled that first shot and harvested not one but two turkeys. A double kill is an incredible feat for any turkey hunter, let alone a novice. Georgetown County gave DNR a special hunting lease for the hunting property in December 2015 in hopes of getting more Georgetown youth outdoors. The DNR Take One Make One program is looking forward to more successful hunts in Georgetown County with youth wanting to go on a first hunt. DNR's Take One Make One program is designed to teach safe hunting practices to youth who have no previous outdoor hunting experience. Take One Make One emphasizes teaching safe and ethical hunting. Youth ages 10-17 are paired with experienced hunters on group hunts around the state. Please visit our web site http://www.dnr.sc.gov/education/tomo/ and Facebook https://www.facebook.com/SCDNRTOMO for more information.